More and more Filipinos today are dreaming of owning their dream home, driving their dream car or launching a new business. But it's also evident how some Filipinos remain hesitant and anxious on making these seemingly elusive dreams happen. “We really have to educate most Filipinos when it comes to financial literacy. Changing their mind-set cannot be done overnight, but it can be done,” says Lubar Delos Reyes, president of DRIVEN Marketing Group, one of the fastest growing real estate marketing network in the country. Common challenges are the notions that purchasing a home entails a long and difficult process and that it is cash intensive. But with the efforts of the government and banks to speed up the process of loan application and documentation, more and more Filipinos are beginning to realize that it’s easy to take the leap. “Around 85% of our buyers are first-time homebuyers and they are quite surprised with how fast and easy it’s nowadays to own their dream house,” adds Delos Reyes. This coming December 27, 28 and 29 at SMX Convention Center Hall 3, DRIVEN Marketing Group Inc.,in partnership with BPI, is set to hold the first and most exclusive property and lifestyle event in the country showcasing the best deals and offers available for homebuyers and investors. 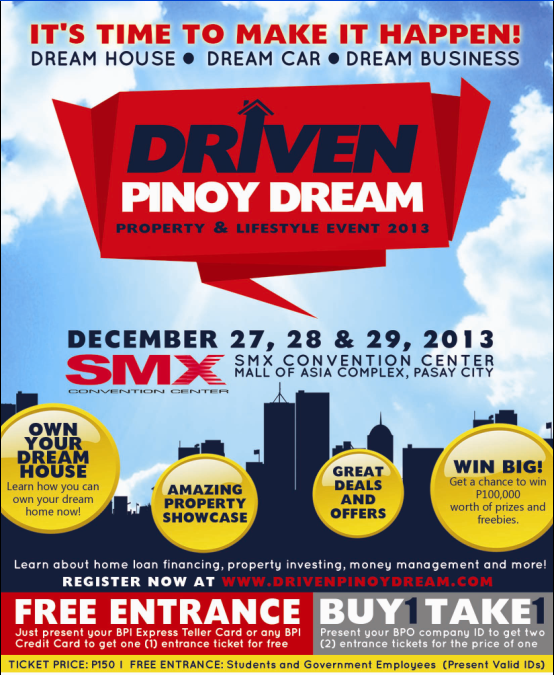 With a campaign entitled “DRIVEN Pinoy Dream Property and Lifestyle Event 2013: Dream House. Dream Car. Dream Business.”, this first of its kind trade show format will allow attendees to interact and learn from the best speakers and institutions in the field of home buying, loan and personal finance. The vision of this event is to uplift our hard working Filipinos and make them realize that all these can be achieved through proper financial literacy, home loan and investment know-how and taking advantage of the smart deals and offers available for them.